What is a Wood Stove Fan? 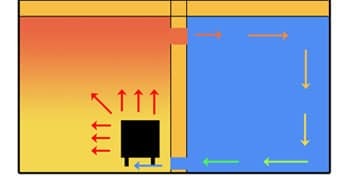 How Does a Wood Stove Fan Work? What is the Ideal Location for a Wood Stove Fan? There's nothing like the nostalgic winter warmth of a wood stove fire, brightening up the room and keeping your toes glowing. However, you may find that you go through fuel like it's water. Equally, while some areas get nice and toasty, others stay as little frost pockets. By installing a wood stove fan, you’ll find that you have a more evenly spread heat, which also helps to reduce your fuel consumption. This saves you money and keeps you nice and warm this winter. Check out our guide to understand which models are great at the job! A wood stove fan helps to circulate the air around the room that is produced from a wood-fired stove. The fan has rotary blades which work to circulate the hot air around the room. To create an evener heat distribution. While a wood stove tends to produce radiant heat, the wood stove fan helps to circulate this heat to warm the room quicker, without cold pockets. While there are some electric models, most rely on the heat from the stove to turn, meaning they need no external power source. It also means they don’t need to reach from a plug socket to the stove. 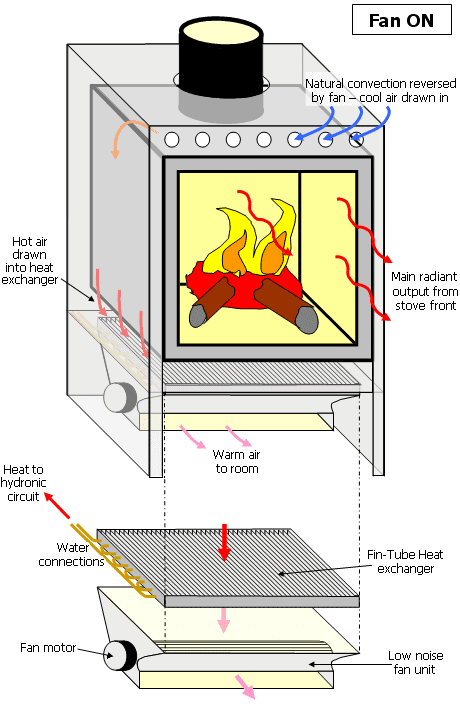 There are two main mechanisms for powering wood stove fans nowadays. Most commonly the technology used is either a Sterling Engine or Thermoelectric Power Generator (TEG). The TEG is perhaps the more commonly used technology as it is highly reliable. The Sterling Engine mechanism works by using the heat produced by the stove. Through the compression and expansion of heat as the force moves through its cycles. A piston contracts as the hot air expands, while another piston retracts due to the cold air contained within. This motion converts this heat energy to the motion of the fan. With Sterling Engine Technology, the heat is produced directly by the stove. There is no electrical transfer occurring in this mechanism. Thermoelectric Power Generators, the most frequently seen technology, have positive and negative semiconductors. In this instance, the heat moves from the stove to the cooler metal of the fan. This transference of energy leads to an electrical current. This is due to a scientific phenomenon coined as the Seekbrack Effect. This energy causes the fan to rotate. The location of your fan will affect its performance. Place your fan on a flat surface. Look for a soft material as a harsh surface can damage it. 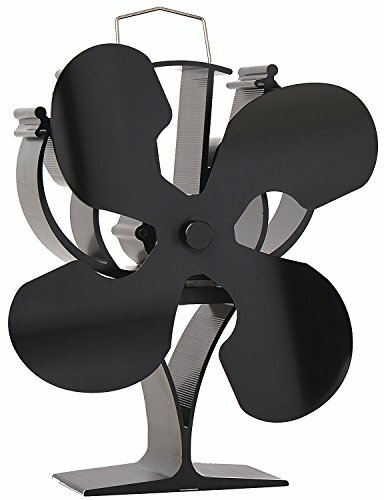 Ideally, you want your stove fan placed in the center or the back of the stove. That said, the fan should be as far as possible from the flue pipe. The perfect position is at the edge of the stove in the middle. The cooler air can be sucked from behind the stove and passed over the blades, helping to kickstart the mechanism. When thinking about the purchase of a wood stove fan, consider a few of the added bonus features that come with the fan. While wood stoves can be beautifully nostalgic, fans can be a little distracting due to their whirring sound. Look for fans with noise-control technology to quieten the device when in operation. Secondly, think about the installation. 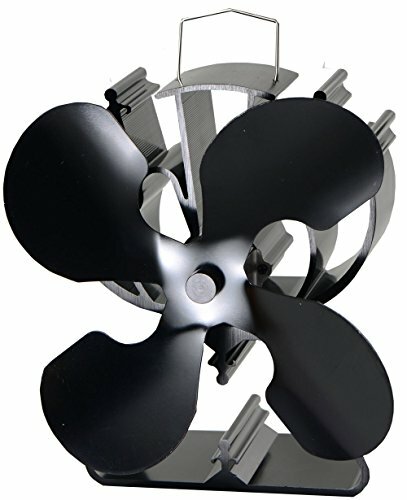 While most of these fans are plug-and-play, some will need to be installed properly for ideal use. Make sure you know where you’ll place the fan and find a model that suits this position. Automatic control means that you can set your fan to move and it will work on its own. You will experience many of these models on your search, and you’ll find they do the job without too much hassle. Some wood stove fans are cool to the touch. While they are few and far between, they’re better if you have small children or pets. Check out the advantages and disadvantages of these wood stove fans to create a clearer picture of what you’re looking for. Bear in mind your own needs, the space you have, and how often you use your stove. This fan needs no electricity and has a 2-year limited warranty. Designed to heat rooms faster, it is ideal for large or small rooms and is made from durable materials. It can cope with big and small rooms. It has been tested in harsh winters in Canada. When this fan is used, you will burn 18% less fuel. 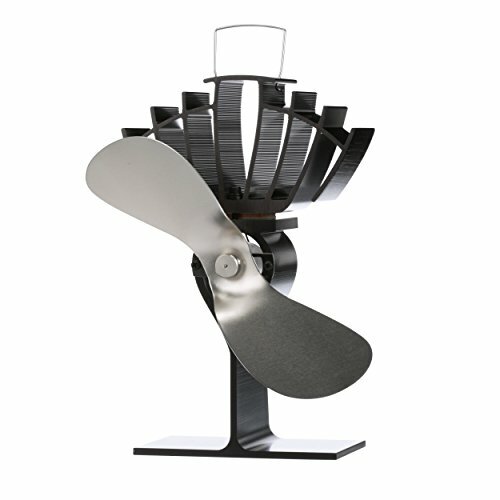 With this stove fan, the room heats up 38% faster. It doesn’t have a very long lifespan. It isn’t as powerful as is seems, especially in drafty rooms. 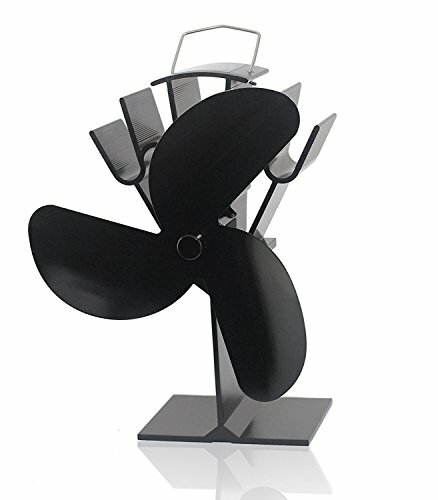 ​It is an aesthetically pleasing fan which helps to lower fuel costs and evenly heat the room. It doesn’t have a lasting lifespan but gives a good boost without extra electricity. This Ecofan model is mid-sized and helps to warm a room up to 31% faster. It works well for rooms of up to 240 square feet and needs no electricity. It has a 2-year limited warranty and has been tested in Canada’s cold winters. It will warm the room in 31% less time. This fan does not need extra electricity. Using this fan reduces fuel consumption by 14%. Tested in Canada, this model is designed for very cold winters. It does not move air very quickly. The fan spins very fast which is a little noisy. A little slow to work, this model is great for cold winters once it gets going. A little noisy, it will help to reduce fuel consumption. Designed to work silently, this model runs without electricity or batteries. It is made from a long-lasting material and will operate to speed up when the room is hot and slow down when the room is cool. It can function at temperatures up to 660F. The material is very durable giving it a long lifespan. It needs no further power input besides the heat from the stove. The fan is a great indication of when the stove needs to be stoked. The blades bend quite easily if dropped, but can be bent back. It needs to be positioned correctly, or it will have limited effect. ​It needs to be handled with care, but it works great when placed in the correct location. It has a long lifespan and can help with fueling the fire. Compact in size, this model needs no external power source. It works using TEG and is silent in operation. The bimetallic safety device helps to protect the internal components at high temperatures. This model works absolutely silently. The bimetallic safety device helps to increase longevity and durability. It works automatically with the heat of the stove, making it easier to operate. It is not as effective as a regular ceiling fan. If it is used over the heat range, it will break. Although it says 660F, it has problems at lower temperatures. With safety measures to protect it and silent operation, this model is a good little-added extra to get more from your stove. It is not the most powerful, so it is better for small rooms. With maximum temperatures of 660F, this model is durable and operates silently. It requires no external power and has 4 aluminum blades. This stove fan operates silently. It is very efficacious despite being quite small. 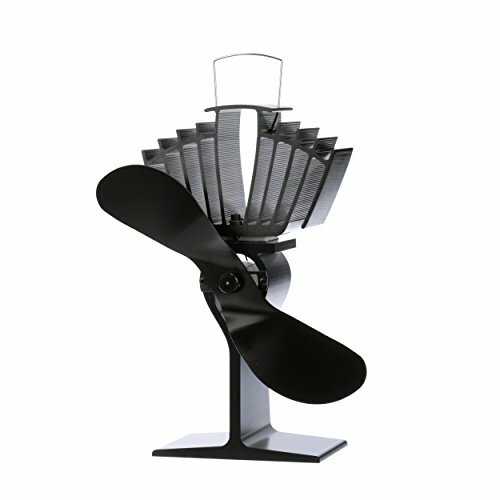 The fan base is made from anodized aluminum to stop it from rusting, increasing the lifespan. Precise placement is the only way to get it working to the fullest. The blades seem to be a little off balance, making it easy to knock over. Lightweight, this model works well when put in the right place. It operates very quietly and is efficacious in spite of its compact design. Installing a wood stove fan on your wood stove is a great idea to increase the warmth of your room more quickly. The fan will help to circulate the air, spreading the radiant heat more evenly. You will be surprised to find yourself enjoying more comfortable temperatures without cold pockets. And you’ll also find that your fuel consumption lowers! A wood stove fan can be an excellent money-saving device that keeps your winter warmer than ever.